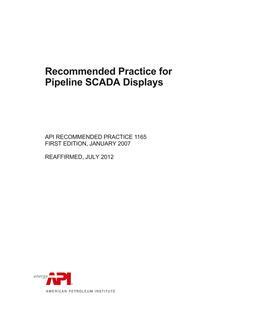 This recommended practice, Steel Pipelines Crossing Railroads and Highways, gives primary emphasis to provisions for public safety under conditions normally encountered in the pipeline industry. It covers the design, installation, inspection, and testing required to ensure safe crossings of steel pipelines under railroads and highways. 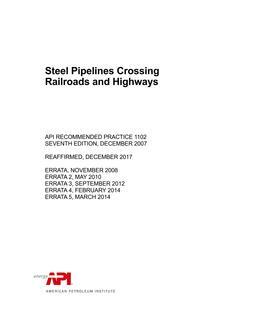 The provisions apply to the design and construction of welded steel pipelines under railroads and highways. The provisions of this practice are formulated to protect the facility crossed by the pipeline, as well as to provide adequate design for safe installation and operation of the pipeline. The provisions herein should be applicable to the construction of pipelines crossing under railroads and highways and to the adjusment of existing pipelines crossed by railroad or highway construction. This practice should not be applied retroactively. Neither should it apply to pipelines under contract for construction on or prior to the effective date of this edition. Neither should it be applied to directionally drilled crossings or to pipelines installed in utility tunnels.